Extrawelt is a prominent German vibrant duo producing electronic music that is totally independent of trends in the electronic music scene. They have had big success with music which is not considered typical for German producers. Nevertheless they have achieved to be among the top rankings of producers in Germany. For Traum they have recorded three 12”s plus remixes. 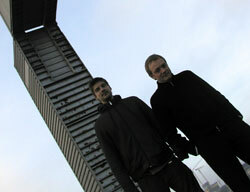 Extrawelt are best described as a curiosum and absurdity. Their freedom and self - determination are the source for beautiful music and big surprises. Extrawelt do not live in the clouds, but between the worlds.